In the heart of a 5000-hectares forest, the designer Matali Crasset has designed and built four feral-type houses that she calls maisons sylvestres. The project was started and developed in collaboration with the inhabitants and volunteers of Le Vent des Forêts in Fresnes-au-Mont , France. The designer started working on her project three years ago. At that time she conceived four cabin typologies that could be considered works of art set in the woods. 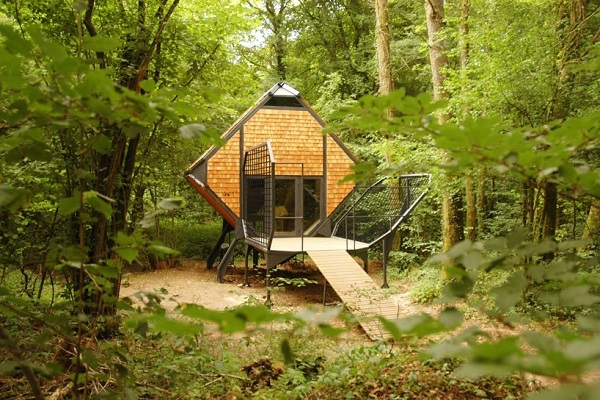 The cabins were to be built in the forests of Lorraine, France in order to bring people closer to nature. The four maisons sylvestres are: la chrysalide, le champignon, le nichoir and la noisette. Each is a small living pod made to accommodate up to four people. In this way, nature lovers can spend their days closer to nature, relaxing in a serene environment and allowing themselves to unwind. These four maisons sylvestres are just a small part of a larger project being developed on the 45 kilometre forest trail named Le Vent des Forêts. Ninety other projects are in the works along this trail, designed by different artists, architects and designers. Crasset’s little houses are scarcely furnished, with only a table, stools and a wood-burning stove on the ground floor and nothing but rugs on the upper floor. The structure of the house has a steel frame clad in timber. There is no foundation making it very mobile. 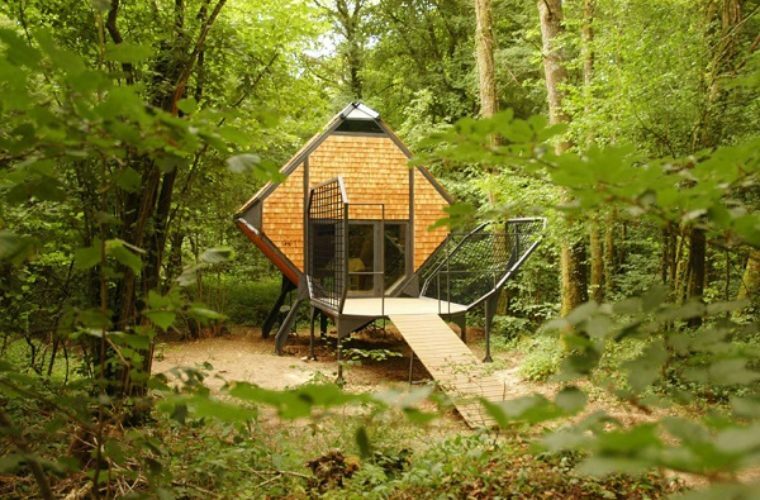 The acacia wood and Douglas pines used for the structure makes it blend in its surroundings, “camouflaged in nature and the securing undergrowth shadows which slowly appear.” Anyone who wishes to rent the cabin, can get the key from the nearby village. The hut is made as an ecological hotel room that offers basic and embryonic comfort. Would you like to spend a night in these maisons sylvestres?